Cranberry & Raspberry - A Herbal Infusion with Cranberry & Raspberry Flavours. Mango & Strawberry - A Herbal Infusion with Mango & Strawberry Flavours. Blackcurrant & Blueberry - A Herbal Infusion with Blackcurrant & Blueberry Flavours. St. Clements - A Herbal Infusion with Orange & Lemon Flavours. These fruity infusions are four of the best; perfect for a mid-afternoon treat. 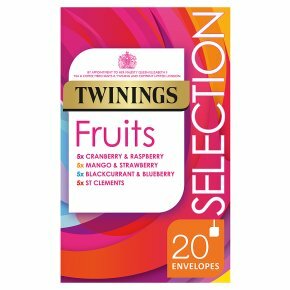 The classic fruity Cranberry & Raspberry, Mango & Strawberry, deliciously sweet Blackcurrant & Blueberry and the refreshing orange and lemon flavours in our St Clements blend. How to drink it Boil fresh water and pour over the teabag. Infuse for up to 3 minutes. Enjoy.